to buy 3 bags of sugar, 50 plates of hibiscus flowers, and 1 bag of milk to make and sell juice, and use the profits to add to her savings. Wend La Malgda Group benötigte 625 US-Dollar, um ein Gewerbe im Bereich Nahrungsmittel auf- oder auszubauen. Das Geld wurde gesammelt und für Wend La Malgda Group bereitgestellt. Mrs. Rasmata just rejoined the group "Wend La Malgda" and became the group leader. She had retired because she was on maternity leave; she thus has a 27-month-old baby. She is married and the mother of three children. The eldest is 16 years old and the youngest is 27 months. Two of her children attend school and the youngest goes to nursery school. She takes care of five people in total. Mrs. Rasmata has been selling juice and working as a hair stylist for five years. She stocks up on supplies at the market in her neighborhood. With the borrowed money, she plans to buy 3 bags of sugar, 50 plates of hibiscus flowers, and 1 bag of milk to make and sell juice. The profits will serve to grow her savings. 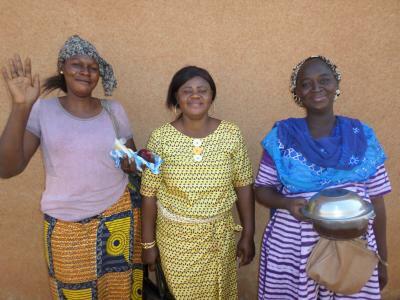 Her goal is to grow her business and help her husband to pay for her children's schooling.